While officially being piloted only in Ohio, CurrentC from the retailer payments consortium MCX is now live at Target stores nationwide (and can be linked with a bank checking account, a Target RED card, and various gift/loyalty cards including Cartwheel). The app will not win any UX prizes and is slow to load on 3G, but it incorporates a unique and ground-breaking innovation: the integration of payments with redemption of SKU-level coupons. This will transform retailing through improving the efficiency of trade-spend which, at $200bn annually in the US, dwarfs interchange of $60bn. It is no coincidence that the top-5 retailers by use of trade-spend are members of the MCX consortium and, with the exception of Meijer, do not accept Apple Pay at point-of-sale. We continue to expect CurrentC to gain a 20% tender-share at participating retailers over the next 5 years with winners being acquirers in the CurrentC-ecosystem including FIS in debit and SYF in credit (see Table below). Trade-spend, where a consumer packaged goods (“CPG”) company and retailer collaborate to promote a particular item (e.g. through merchandising display, feature ads, and discounting) amounts to $200bn annually in the US and is the largest expense item, behind COGS, for CPGs representing 15-20% of sales. It is notoriously inefficient because, while CPGs can access POS-scans for promoted product, they cannot link these to the personally-identifying information or PII of customers and so assess whether the trade-spend generates an incremental sale or merely subsidizes a sale that would have occurred anyway. Through its partnership announced in August with Inmar, which carries the highest inventory of trade-spend offers in the US, MCX is looking to improve trade-spend efficiency through marrying PII (captured when a customer enrolls in the wallet) with POS-scan data. CurrentC is the only mobile wallet that is integrated into the POS systems of multiple retailers and hence the only wallet that is capable of supporting SKU-level coupons for a CPG brand that shoppers can redeem at more than one retailer. The ultimate consumer appeal will depend on how many CPGs choose to participate and MCX has chosen not to announce details beyond saying “a number of top CPGs have already engaged with Inmar to provide MCX with offers spanning a variety of product categories”. As retailers use CurrentC to improve trade-spend efficiency, there will be a transformation in the economics of the payments business and customer shopping rewards. As ammunition for retailers to outbid banks as distributors of payment cards, trade-spend in the US is more than 3x interchange-spend of ~$60bn and, while not all trade-spend will be digitized through CurrentC, the case for digital coupons is strong. Beyond the consumer-driven shift from paper to digital media, digital coupons have redemption rates that are 13-14x higher than traditional free-standing insert or FSI coupons distributed in flyers and newspapers. We expect more details of CPG participation in the next couple of months as CurrentC broadens its pilot from Ohio and continue to view the product as transformational to the retail and payments industries with winners, on the payments side, including FIS for debit processing and SYF for credit processing. The solution, of course, is to combine the scan-data recording the purchase at point-of-sale (and triggering a trade-promotion payment to retailer from CPG) with the personally-identifying information or PII of the customer and then offer discounts to targeted customers based on price-sensitivity rather than to all customers via shelf-offers. CurrentC is an enabling catalyst for this personalized pricing because it provides a medium through which discounts can be pushed to customers, in the form of SKU-level digital coupons, and because it can be tied to PII. Indeed, in August, MCX announced a partnership for its CurrentC wallet (which captures PII through the customer enrolment process) with Inmar which will be the promotions management and processing vendor for the wallet. Furthermore, just this July, Inmar purchased Scan Apps which is the leading provider of promotional services that use point-of-sale data to validate that a trade-promotion sale has taken place and hence qualify a retailer for CPG trade-spend for selling a promoted product to a consumer. 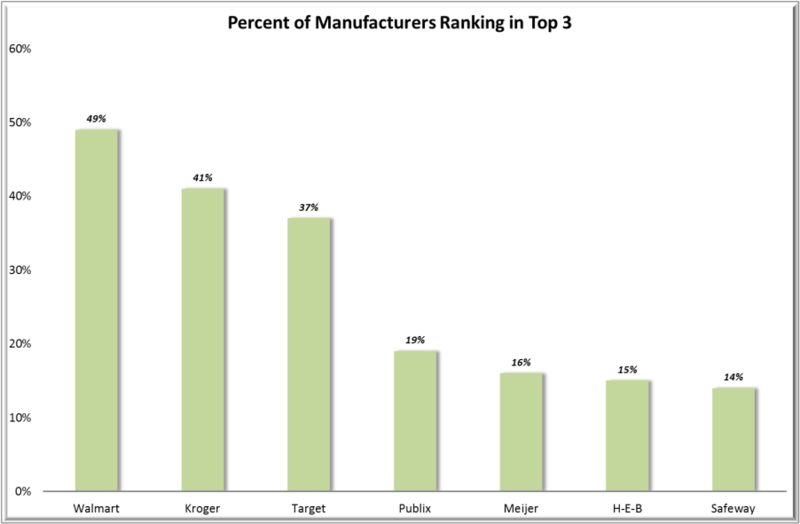 The retailer motivation for third-party validation is that it allows a more credible bid for an increased trade-spend budget from CPG suppliers, and it is no coincidence that the top-5 retailers by trade-spend are all MCX members (see Exhibit 1). The CPG motivation for third-party validation is that is allows a more efficient sizing and allocation of trade-spend budget based on measured performance. We view the bringing together of POS scan-data and PII as a foundational innovation in retailing, that will lead to a cascade of follow-on innovations in much the same way that continuous-aim firing did for naval gunnery. The common ground is that both innovations generate feedback and hence guide a new trajectory of experimentation and improvement in targeting technology. There are likely to be winner-take-all dynamics in that retailers who are most effective at using customer data to target promotions will receive an increasing allocation of CPG trade-spend. The significance of this to the payments business is that the CurrentC wallet will be integrated with trade-promotion in ways that other mobile payments solutions cannot match. For example, TGT uses its Cartwheel app to feature a promoted product with validation of a trade-promotion sale by SKU-level and by customer occurring seamlessly (via Inmar) when the consumer registers Cartwheel into the CurrentC app and uses it to make payment. This cannot be achieved on bank-issued payment accounts (whether or not accessed via Apple Pay and Android Pay) because the data are split: the bank, not the retailer, has the PII and the retailer, not the bank, has the SKU-level purchase data. As MCX notes “because CurrentC ties into the POS systems of each merchant, MCX can enable SKU-level offers – i.e., they can offer a discount on a specific brand of candy bars compared to just on a total shopping cart … CurrentC is the only mobile wallet that can do SKU level coupons across multiple merchants”.